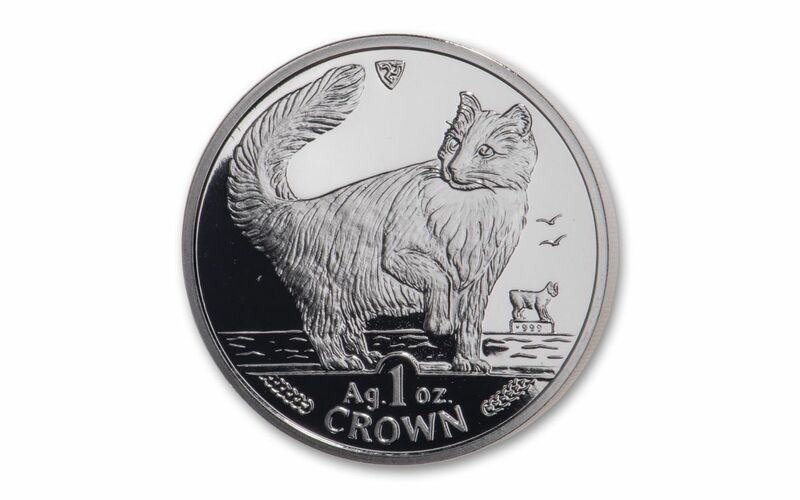 Now you can add the key-date fourth year coin in the series to your collection with this 1991 Isle of Man Norwegian Cat Silver Proof. Struck in a Troy ounce of highly-pure 99.9% silver, this legal-tender coin bears a denomination of 1 Crown and celebrates a cat bred especially for the cold winters of Scandinavia: The Norwegian Cat. 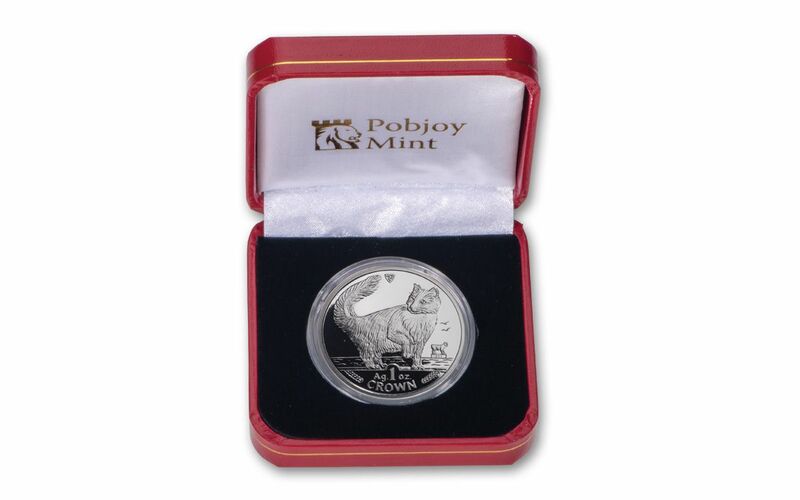 Expertly crafted by the artisans at the Pobjoy Mint, the coin’s proof finish is the result of hand-selected planchets, polished dies and multiple strikes to produce beautifully frosted details rising over mirror-like fields. Famed for its strength, intelligence and thick woolly coat, the Norwegian Forest Cat is a uniquely Scandinavian species steeped in the enchantment of ancient Norse legends. Brought to Norway around 1000 AD by the Vikings, the Norwegian Cat is described as courageous and always on the alert. This breed is not only larger than an average cat but also has a lot of energy and demands a lot of attention – especially from people they like. They are swift and effective hunters with claws so strong that they are able to climb rocks. Powerful and rugged, the Norwegian Forest Cat is equally at ease inside lounging on their favorite person’s lap. 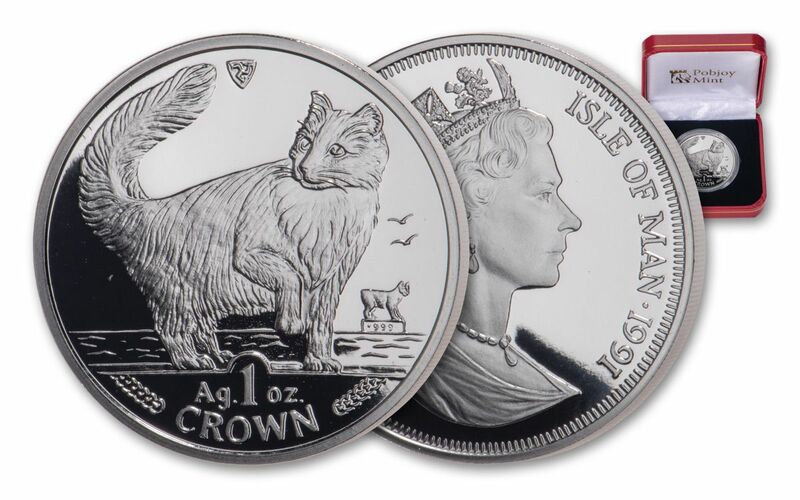 KEY FOURTH YEAR OF POPULAR SERIES – The 1991 Isle of Man Norwegian Cat Silver Proof is the fourth release in the Pobjoy Mint’s popular cat series that ran from 1988-2016. The coin’s reverse depicts the Norwegian Forest Cat in splendid detail. The coin’s obverse features a profile of a young Queen Elizabeth II. 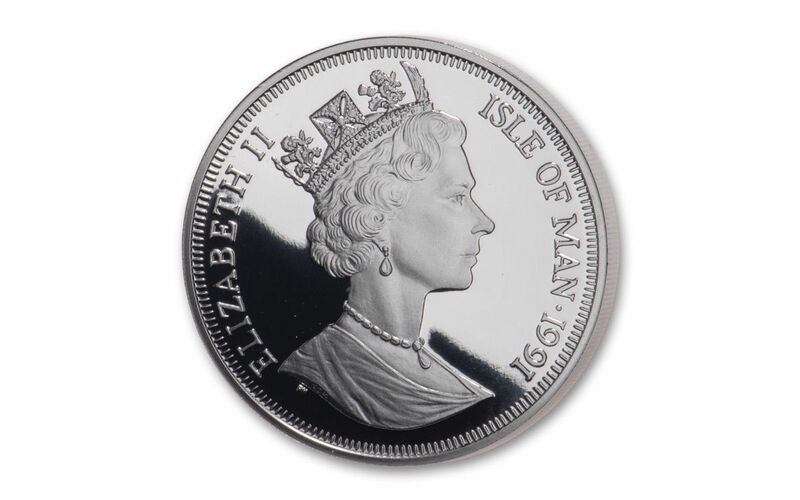 STRUCK IN HIGHLY-PURE SILVER – Each 1991 Isle of Man Norwegian Cat Silver Proof is struck in one ounce of highly-pure 99.9% silver. GORGEOUS PROOF CONDITION – Your 1991 Isle of Man Norwegian Cat One-Ounce Silver Proof was expertly crafted by the artisans at the Pobjoy Mint from hand-selected planchets, polished dies and multiple strikes to produce beautifully frosted details rising over mirror-like fields. There are only a limited quantity of 1991 Norwegian Cat coins left in the Pobjoy Mint’s vaults. Once they are gone, no more will be struck – ever. Don’t miss out, order yours now!